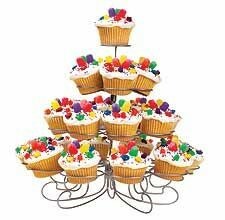 The look is fresh and fun, featuring bold silver-finished wire spirals to securely hold each cup cake. The twisitng, towering design is perfect for any setting and makes the perfect centre piece for a baby shower, birthday party, wedding, christening and so on. Can be used time and time again. 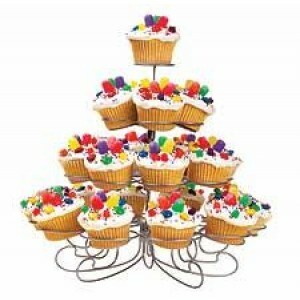 Holds 23 standard Cup cakes. 12" high x 13" wide. Stand only supplied.